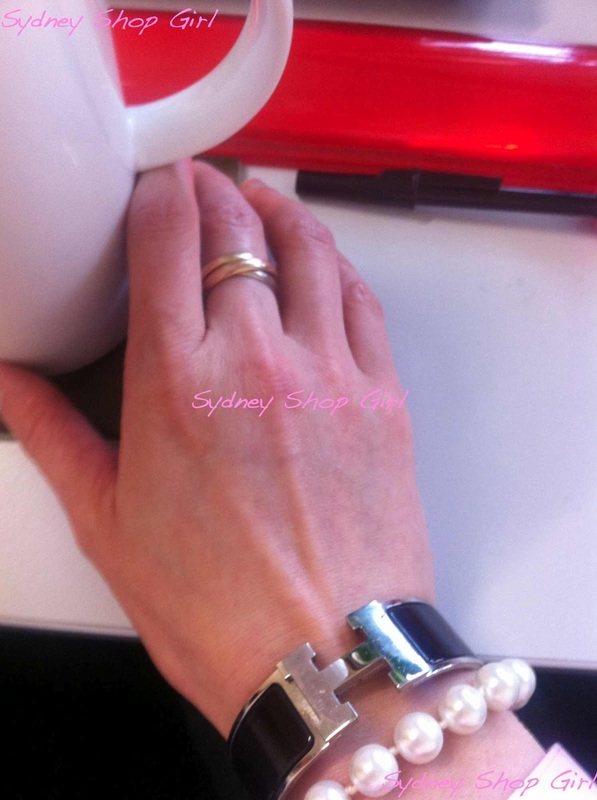 Sydney Shop Girl: An Arm Party. Shirt Semantics. Off the Cuff Pasta. An Arm Party. Shirt Semantics. Off the Cuff Pasta. I hope I remember everything. You can never go wrong with an arm party featuring fearls and Hermes. I wonder if that's a truth universally acknowledged, even. When I'm not arm partying, I'm worshiping at the church of the fitted shirt a great deal these days. They're perfect for this warmer weather. To be quite frank about it, I've been in a parallel fashion universe for most of Autumn / Winter 2012. Whilst the rest of the world has been going mad for peplum dresses and trousers with loud prints in hard to pull off cuts, I've been hibernating in a range of chunky knits, leggings and flowing dresses. So this transition to fitted shirts and more structured bottoms has been liberating and morale boosting. 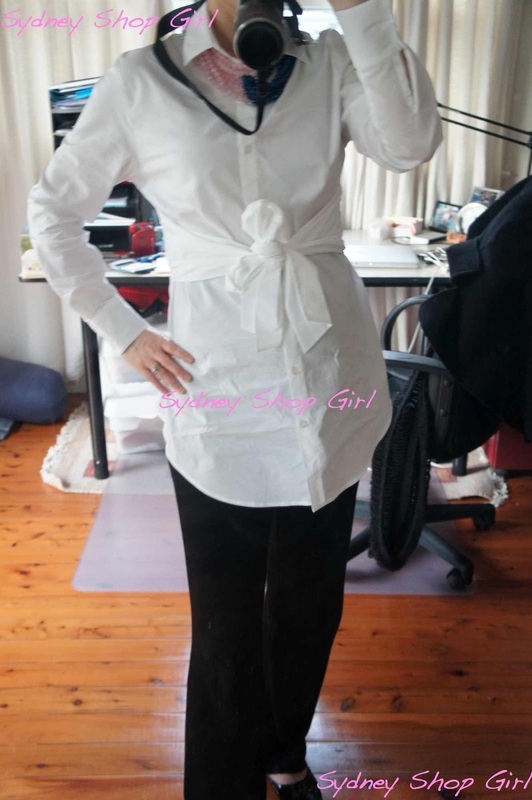 Shirt and trousers - Isabella Oliver Maternity. Flats - Tory Burch. I also like how white shirts make me feel Dressed and Work Appropriate. Even if they do have a tie front at the waist. I was hoping for the 'referenced Japanese ready to wear circa 1990'effect with the obi / tie front today but I understand entirely if you feel that it makes me look more like a Christmas present. I wore my new Isabella Oliver Maternity ensemble Red Phoenix Emporium's Petite Four necklace today. Just between you. 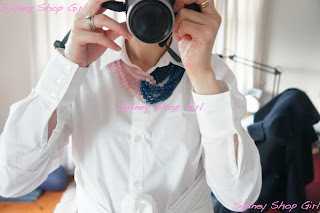 me and blogger, I have quite a number of new Isabella Oliver items coming my way as this post goes live. I am powerless in the face of a good sale on forgiving stretch fabrics. It was ironic that while I was having a perfect white shirt day, I walked past not one but three school girls channelling Britney from back in the day. Those girls did not miss a detail. The black bra under a white shirt, the pony tail, the thigh high school skirt. At 5pm on a school night, in a suburban shopping centre. Right under my nose. And before I'd had my late afternoon snack and a lie down too. These days, post babies Britney favours a more modest approach to a white top. I love how she's paired her white jacket with pink skinny jeans in this photo. I was almost going to call my tie waist shirt a shirtwaister until I realized that shirtwaisters are in fact what Americans call shirt dresses. Modelled here by the American First Lady of shirtwaisters, Diane von F. Incidentally, I have a pregnant friend who swears by a DVF shirt dress or two in her maternity wardrobe. I am this close to investigating this possibility. I will report back if I do. Once I've made good use of my Isabella Oliver order, that is. A shirtwaist on the other hand, is meant to look a little something like this. Now that we're done with shirt dress semantics, let's talk about off the cuff pasta recipes. I can tell it's going to take me the entire post to get those shirt references out of my head. I'm obsessed with creamy pasta dishes at the moment. But only if there's lots of vegetables involved and the sauce doesn't involve raw eggs. So I came up with a recipe involving eye ball amounts of basil pesto, sour cream, lemon juice and parmesan cheese. 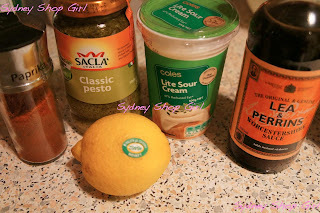 I've been working with the juice of 1 lemon, 4 tablespoons each of sour cream and pesto, 2 - 3 tablespoons of grated parmesan and a few shakes each of Worcestshire sauce and paprika. This makes plenty of sauce for half a packet of pasta. Once you've stirred your sauce and seasoned to taste, set it aside and find some vegies. I'm liking a mix of raw and cooked at the moment. You probably know this already but if you can source your veg from a non supermarket source, you'll get huge dividends in the taste stakes. My raw vegies of choice are baby spinach leaves and heirloom tomatoes. For the cooked component, I've been loving asparagus. For some reason it's all coming from Peru these days but it is delicious despite the distance it has had to travel to get to Sydney. The only stovetop element of this recipe involves boiling the pasta and asparagus. I usually add the asparagus to the pasta pot for the last 7 minutes or so of cooking time. Once it's all done, drain and return the pot. 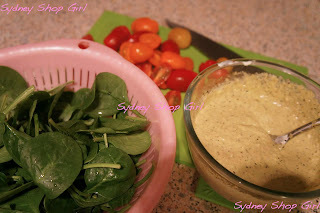 I stir in the spinach at this time, then the sauce and sprinkle with chopped tomatoes. Not only is this a wonderful, sort of light and definitely tasty meal, it also reheats well the next day. Or you can have it cold. Can you believe it. The week is just about done. All that remains is a little thing called Friday before we all head into the weekend and I, for one, head into 3 weeks of annual leave with a trip to Sweden thrown in. That pasta looks delish, I'm definitely going to try it! Love your bracelets and the shirt looks great on you :) Enjoy your Friday! I have next week off so eagerly awaiting the end of the week! SSG, I can't tell you how glad I am that it's almost Friday! It's been a rough week in Antipodean Land! Your pasta dinner looks very yummy and I think I might be tempted to give something like that a go tonight.